In India, there is hardly any economic event that captures popular imagination as much as the Union Budget. This Explainer will focus on the complex budget jargon that puts off even 'interested–in–budget' souls. The Central Government must seek approval of the Parliament to withdraw money from the Consolidated Fund of India to meet expenses. A full budget goes through a long process; with elections due soon and without parliamentary approval, the Central Government may run out of cash to meet expenses. This may paralyze the functioning of the government (a la the shutdown in the U.S.). Tell me more about Vote on Account (VoA). VoA is generally undertaken for only two months and can’t exceed six months. o Term of the current government ends close to 31 March. o Interim Budget focuses on both revenue & expenditure whereas the VoA focuses ONLY on expenses. Any twelve–month period that is used for submission of accounts, taxation purposes and to state financial reporting by private and public sector companies is called a Fiscal Year. In India, the Government has laid down the provision that the 12–month starting on April 1 and ending on March 31 of next year will be treated as a Fiscal Year. To put it in perspective, this article is being written on 1 February 2019, i.e., in Financial Year 2018–19. This is also called Fiscal Year ’19. In the same way, the financial year for 2019–20 will start on 1 April 2019 and will end on 31 March 2020. So, on 1 April 2019, we will enter Fiscal Year ’20. The Budget is a statement of revenues and expenditures for the coming fiscal year, i.e., the one that starts on April 1 of this year. What does the Budget consist of? Look at the table graphic below. This document titled, Budget at a Glance, is the best document to understand the components of the various types of figures in the Budget. (d) Budget Estimates for 2019–20. The Actuals for 2017–18 may be represented as such but they STILL would be PROVISIONAL only. This means that these figures are NOT the final figures for 2017–18 but are subject to further revision. In fact, the final figures for 2017–18 will only be available toward the end of Financial Year 2018–19 (or Fiscal Year ’19). Budget Estimates (BE) relate to the figures set out by the Finance Minister in his Budget Speech last year (i.e., in February 2018) for the Financial Year 2018–19. However, all figures – related to revenue collection, expenditure, other allocations – are subject to change. These numbers are mere ESTIMATES and not actuals. As the year progresses, such figures may sometimes need to be revised. For example, if there is low industrial and agricultural activity (meaning lower economic output), tax collections may dip. This, in turn, will reduce the government’s Revenue Receipts. In such case, the Government may revise the Budget Estimates (made in the Budget). Such altered figures are labeled Revised Estimates (RE). These RE are listed in the third column. 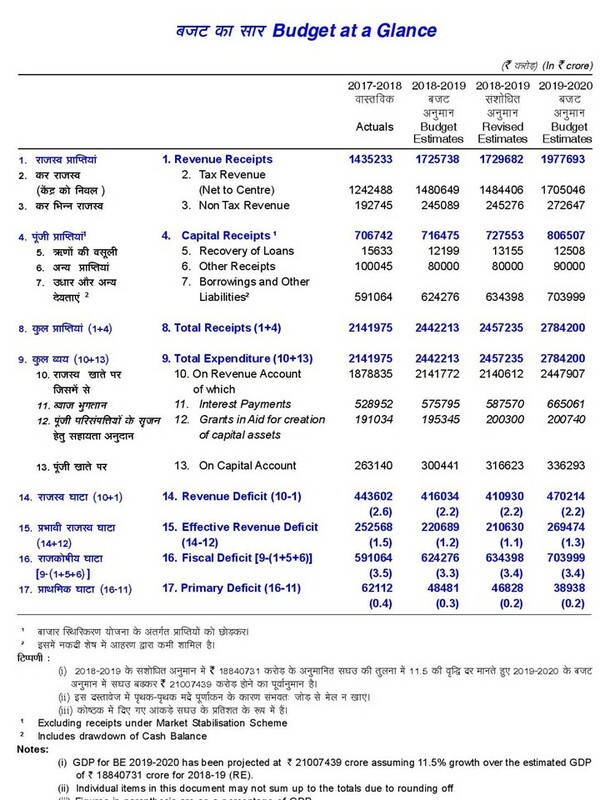 In the fourth and last column, you will find Budget Estimates for the coming Financial Year 2019–20. These figures reflect the various estimates made by the Government in terms of Receipts (including tax collections) and Expenditures (including interest payments and salary payments to government employees).